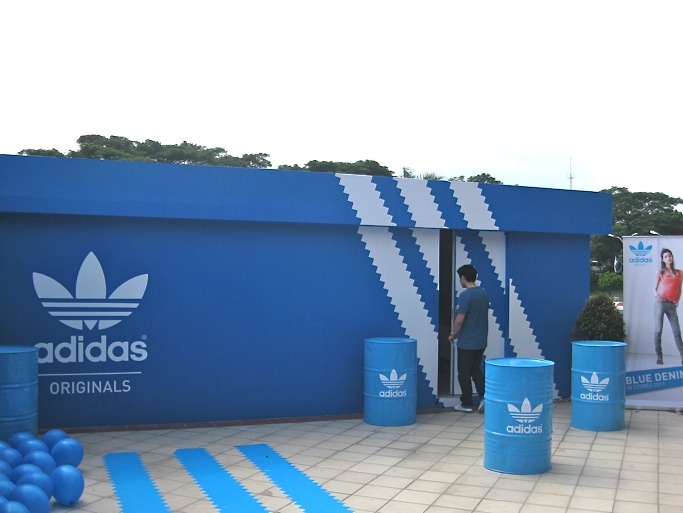 if you happen to find yourself in alabang town center, do drop by the adidas pop-up store. it's hard to miss—it's shaped like a giant blue adidas shoebox! the adidas pop-up store will be at ATC till the end of january 2011. we wanted to go in and check out the merchandise but as we slid the door open, we saw half-naked male models getting dressed, woo-hoo! no, they were not for sale; they were getting dressed for the fashion show. adidas was launching its new denim line called adidas originals blue collection. so what makes this different from the hundreds of other denim labels out there? it's all in the details. Building on the popularity of the 3-Stripes brand in footwear, all denim cuts are specially designed to be perfectly wearable with a pair of sneakers. Straight but not narrow legs from the knee down as well as overall loose fits reflect the perfect street wear look. As a novelty, adidas Originals introduces the first sneaker protector on jeans. A special material on the inside cuff of the trouser legs protects the sneakers from being dyed as it normally happens when wearing new denim in combination with light-coloured suede or canvas sneakers. the adidas originals blue collection will be available beginning january 2011 at the adidas originals concept store, trinoma. prices start at P3,900. is there a website that lists product details- like up to what size it comes in? Merchandisers/buyers in manila tend to be very size-ist. Am willing to buy a pair, but if they don't have my size, they don't get my money.